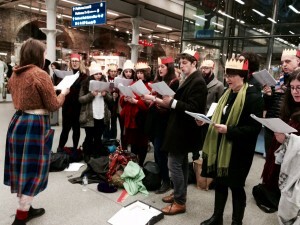 Browse: Home / News / Volunteers Rock Around The Christmas Tree to Raise £282! Volunteers Rock Around The Christmas Tree to Raise £282! 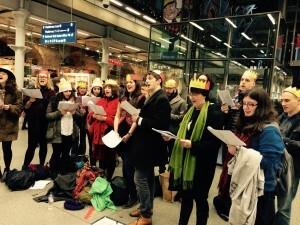 Last night, a dedicated bunch of Mind in Camden staff, volunteers and allies – led by our intrepid Paranoia and Beliefs Development Worker Molly Carroll – descended on St Pancras Station to raise money for our charity. Armed with our handmade ‘Mind in Camden’ christmas party hats, some collection tins, wooly coats and some amazing christmas jumpers, our troop raised an amazing £282 in the one hour slot that St Pancras kindly gave us. As upbeat tunes such as ‘Rocking Around The Christmas Tree’ and ‘Rudolf The Red Nose Reindeer’ rang out alongside some old favourites like ‘Once in Royal David’s City’, the atmosphere was fantastic. Our collectors were often stopped by people who had some connection with the charity, either through receiving support or fundraising for National Mind. The tunes seemed to help get shoppers into the christmas spirit, and given the number of photographs taken by passers by we may turn up on YouTube or Instagram sometime later in the week. One gentleman even asked a collector to photograph him with the singers! It was all for a good cause, as this money will help us to continue to provide services for young people and adults who struggle with mental health issues in Camden, and beyond.